Last updated on June 8, 2015 December 12, 2016 by Daniel Waldron for Armagard Ltd.
With digital signage displays proving to be a hit across many venues, Armagard examines if they can have a similar impact across hippodromes, worldwide. The original hippodrome was an ancient stadium built in Greece. It was used for the purposes of horse or chariot racing. Nowadays, the term hippodrome is widely used across the modern French language and other European languages, but hippodromes of the 21st century tend to take on the appearance of a theatre. Perhaps the most famous hippodrome, still used for the original purpose of horse racing, is the Hippodrome de Vincennes in Paris, France. Can digital signage displays work for hippodromes? Yes! Given the resounding success of digital signage displays across the entertainment and leisure sector, worldwide, digital signage displays certainly can work for hippodromes. The Birmingham Hippodrome was one of the more recent facilities to install digital signage displays, which has enabled them to reach a much wider proportion of the passing public, helping the facility to drive footfall and increase ticket sales for the variety of performances that it hosts throughout the year. It is the commercial benefits of digital signage displays that appeal to hippodromes, which is why Armagard has experienced a rise in the number of hippodrome facilities requesting digital signage deployment, particularly in France. Recent projects include the Hippodrome D’Auteuil and two different venues in Toulouse. Why are hippodromes starting to use digital signage displays? Aside from the commercial benefits, digital signage displays represent an opportunity for hippodromes to streamline their marketing process. Where events used to be publicised via printed posters and third party advertising, digital signage provides a single solution that can be managed more efficiently. Operational directors of hippodromes also recognise the impact digital signage displays have had in a stadium setting. 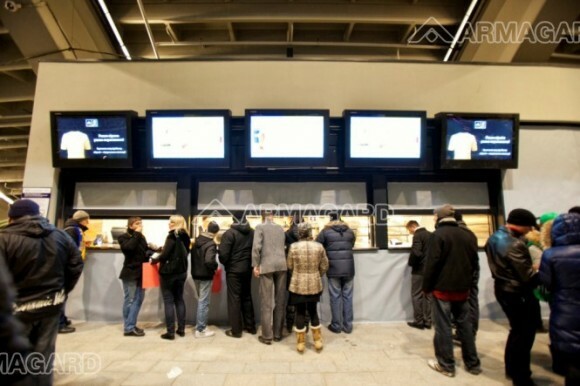 In a stadium environment, digital signage units serve as the ultimate point-of-sale system. Digital signage units deployed throughout sports arenas are usually used as digital menu boards or they’re strategically positioned close to concession stands and along concourses to drive sales in an effort to boost revenue streams. Armagard digital signage displays in use at the Euro 2012 Football Championships. Notice how they’re positioned above the ticket sales kiosk. Hippodrome venues want to replicate this kind of impact and appeal to their audience demographic. Taking the Birmingham Hippodrome as an example, this venue averages over 500,000 visitors per year. It is regarded as the most popular hippodrome in Britain. With no source of funding, the venue is reliant on ticket and merchandise sales and their investment in digital signage now represents their biggest driving force behind increasing those sales. It should come as no surprise that the Birmingham Hippodrome recorded a record 625,732 tickets sold in April 2014, coinciding with the installation of digital signage displays and highlighting the significant role digital signage plays in reaching a wider audience. If you’re the operational director of a hippodrome, contact Armagard about getting digital signage displays installed across your venue. We offer a huge range of digital signage solutions to suit the hippodrome scene. We supply LCD enclosure units in landscape, portrait or totem styles and they’re all fully industry certified for indoor, semi-outdoor or full outdoor use. Plus, you can choose to ceiling mount, pole-stand mount, floor mount or wall mount your unit. To get a personalised price for your digital signage displays, pick up the phone today and dial 0121 608 7226. Alternatively, complete the ‘Quick Enquiry’ feature on the right of your screen now. Like what you’ve read? Then keep up-to-date with all the ‘goings on’ at Armagard, including company news & new product launches by subscribing to our quarterly newsletter or by tuning in to our social media channels. Find us on Facebook, follow us on Twitter or connect with us on LinkedIn.